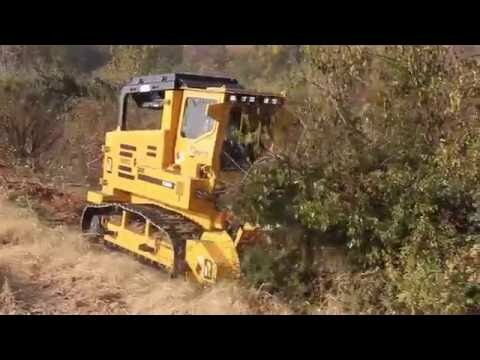 T360 Forestry Mulcher & Hydra-Stumper | Forestry Machines | Ohio | Rayco Mfg. The T360 is a powerful forestry machine that is designed to be equipped with either a stump cutter or forestry mower/mulcher. It’s powered by a 360 hp Cummins QSM11 engine that produces peak power of 385 hp and peak torque of 1,350 foot-pounds. A closed loop hydrostatic system powers the cutter head, sending 140 gallon per minute to the attachment’s drive motor(s). Rayco’s exclusive elevated cooling design keeps engine and hydraulic systems cool in even the harshest of conditions. Debris screens trap airborne chaff before it can plug radiator fins. Reversing fans clear debris screens on-command, extending service intervals. Inside the cab, the operator is kept comfortable in the fully-sealed and climate controlled environment. Onboard diagnostic and monitoring information is provided through a color LCD panel, allowing the operator to track numerous aspects of machine performance and operation. The T360 can be equipped with either a Hydra Stumper stump cutter attachment or a Predator forestry mower/mulcher. The Hydra Stumper head muscles through stumps with its 48”diameter x 3” thick cutter wheel equipped with 56 Monster Tooth cutter tools. For mowing/mulching applications, the Predator mulcher head has a 8-ft cutting width and is powered by a pair of variable displacement drive motors.